Shares in Asia closed lower Monday. Hong Kong's Hang Seng Index dipped 0.4% to 20,889 and China's Shanghai Composite Index slipped 0.1% to 2,639. In Japan the Nikkei 225 Index fell 0.7% to 9,117. Shares in Warren Buffett-backed BYD, an acronym for Build Your Dreams, slumped 3.8% today after the electric car and battery maker missed analysts estimates and posted a second-quarter profit of only $106 million, according to Bloomberg. 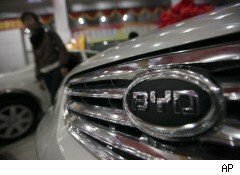 BYD shares have declined 35% this year, shrinking the wealth of the company's chairman Wang Chuanfu, who last year ranked as China's richest man with a $5.1 billion fortune, according to Hurun Rich List, which ranks China's wealthiest people. He also came in at number 559 on Forbes magazine's list of billionaires. China's economic slowdown has forced the company to slash its sales target by 25%, and is hoping that the unveiling of new models will spark new interest among buyers. BYD's F3 was one of China's top sellers last year. Other Hong Kong carmakers also suffered today with Geely Automobile tumbling 2.9%, Great Wall Motor, which makes SUVs and pick up trucks dived 2.8% and Dongfeng Motor falling 0.4%. Hong Kong energy producers lost value with Sinopec, officially named China Petroleum & Chemical, falling 1.6% and Cnooc, the oil exploration company, dropping 0.6%. China Shenhua, a coal-based energy firm, slid 1.4%. Cathay Pacific bucked the downward trend in airline stocks today, rising 1.5% after an agreement with cabin workers prevented strike action. Other Chinese carriers were not so lucky, with China Eastern Airlines nosediving 3.3%, China Southern Airlines declining 1.6% and Air China down 1%. Another winner today was West China Cement, which surged 15% in today's IPO. The company de-listed in London and launched in Hong Kong, where it expects to see better performance. In China, producers of raw materials headed south with Aluminum Corp. of China, affectionately known as Chalco, plunging 3.2%. Shanghai-listed shares of China Petroleum & Chemical Corp. slid 0.8% and, Zijin Mining, which produces gold as well as other minerals, fell 0.8%, and Yanzhou Coal Mining receded 0.7%. Real estate shares were also hard hit with China Vanke losing 1.9%, Poly Real Estate sliding 1.5% and Gemdale inching down 0.5%. In Tokyo, gloom over the state of the global economy dragged the Nikkei lower. Big losses among exporters included a 2.5% loss by Sharp and a 1.4% drop by Canon. Electronics giant Sony, declined 1.5%, and Fuji Electric, which makes everything from vending machines to semiconductors, plunged 5.4%. Among popular car companies, Toyota fell 0.8%, Nissan dropped 0.6% and Honda lost 0.5%. Even audio sound system expert Clarion gave up 2.3% and car parts maker Jtekt dipped 0.6%. Motorcycle specialist Suzuki closed 2.3% lower. Until the U.S. releases better news about the state of the economy, Asian exporters of high-ticket items will remain in jeopardy.